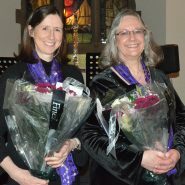 After eight years of running Cantata Music Education with Catherine, Annie has left and is moving to Scotland to be nearer to her father and step-mother. All the groups said a fond farewell to Annie in December and her place at the piano has been taken over by Pam Jay. Pam started with us in January and has settled in well to her new life with Cantata.